Good morning. This week’s card is cased from page 54 of the annual catalog. It uses the Broadway Birthday bundle on page 69, of the annual catalog. Below is the card in the catalog and my card. I used Lovely Lipstick for the card base, the Broadway Bound Specialty DSP and Whisper White. The DSP is really nice and is found on page 188 of the AC. The sheets are 12 x 12 and are thick with lots of gold foil on one side. I used coordinating colors from the DSP paper, stamped with the Broadway Birthday set and die cut with the Broadway Lights Framelits. This bundle along with the entire suite, found on pages 68 & 69 of the AC, makes wonderful cards or scrapbook pages for your celebrations. It can be found in my online store as well. Here is the link to my store darleneseitz.stampinup.net. Please use the current host code, which is DGWJFYWA, when ordering (orders of less than $150.). Thank you for tuning in this week and happy crafting. Here is a card using what I would call a WOW stamp set called Beautiful Day, which is in the 2018-19 annual catalog. I cased the card based on one shown in the new catalog on page 23. See my card and catalog card below. I used the following products and techniques. These products can be found in my online store at darleneseitz.stampinup.net. Please use hostess code DGWJFYWA when ordering. Join us on the Caseing Tuesday Facebook page and join in the fun. Thanks for tuning in this week and Happy Crafting and CASEing. 1. Big Wishes stamp set, new this year. I stamped the image in Blueberry Bushel ink and then cut it out. 2. Lovely Lipstick card base. One of the new in-colors for 2018-20. 3. Whisper White card stock embossed with the hexagon 3D folder. 4. In-Color DSP, Blueberry Bushel. Also a new in-color this year. 5. Square frame cut using two of the Stitched Shapes Framelit Dies. 6. I added a tiny bow and pearl. I also did the inside with another stamped greeting from the same stamp set and included a larger bow die cut from a retired die set, Balloon Pop Up Thinlits. Any Birthday embellishment etc. would look fine here. I hope you have enjoyed this weeks’ card. If you would like to purchase any of these products, please go to my online store at: darleneseitz.stampinup.net. Please use hostess code DGWJFYWA for orders under $150., and receive a free gift from me. I had fun working on this week’s card. I used a new stamp set and dies from the 2018-19 Annual Catalog. Here is my card and the card cased from the Annual catalog. I dragged the craft white ink pad across the small blue layer instead of the card base. I used the Sea of Texture stamp set and matching dies. This is a fun set to play with. For the trim on the small layer, side; I let the sea net hang over the edge. The colors I used are Pacific Point and Soft Suede. Rather than cutting out the sand dollar with the dies, I embossed it using the new Big Shot Embossing Mat and the die. This product doubles the use of your dies and is quite inexpensive and can be found on page 222 of the new catalog. I also wet embossed the greeting in white and popped up some of the cut outs with dimensionals. Thank you for tuning in again this week. I struggled a little with the colors and set to use but settled on my new go to Love What You Do from the Share What you love bundle. I really love this suite and have used it a lot. I used the colors Berry Burst and cut out some flowers from the Share What You Love paper, leaving a splash of Mint Macaron. The dolly is also from the bundle . I hope you enjoy the card. The Suite of products is on page 176-177 of the new Annual catalog. I’m a little behind so here is my Tuesday card on this Friday evening. It is based on the card shown below. I turned the card and used the new Share What You Love Specialty Designer Series Paper for the oval. I used the Basket Weave embossing folder which was a sale-a-bration item and will be available in the new annual catalog come June 1. I also used the leaf punch, stitched framelits, tranquil tide paper & ink, along with a layer of mint macaron which is a returning color available again in the new AC. Other items used are clear gem embellishments, vellum paper and copper washi tape. As I mentioned, the new Annual catalog is available to order from on June 1st. If you would like a catalog (and don’t already have a demonstrator), just email me your address (darstz@hotmail.com) and I will mail one out to you. You can also see the new catalog in my online store effective June 1st. 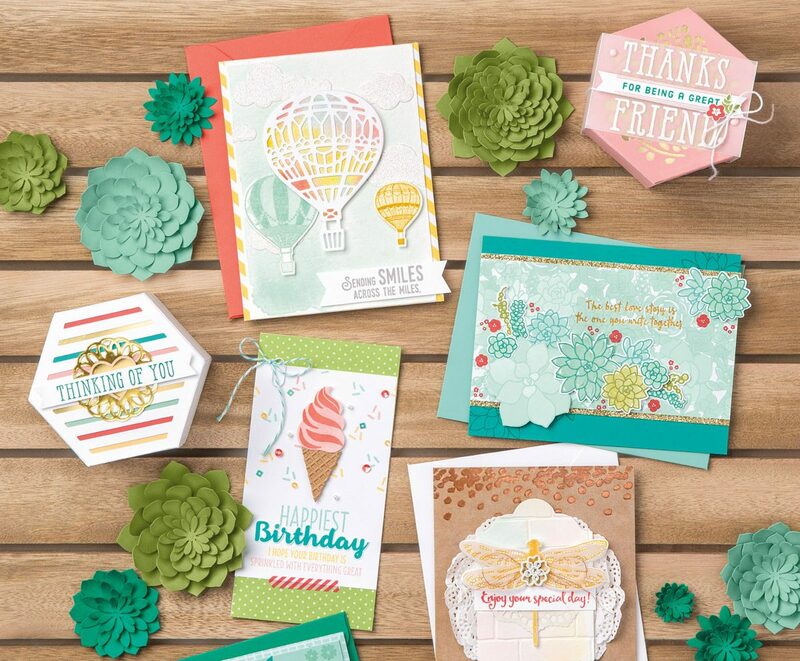 The current annual catalog, along with the retiring items (some discounted up to 50%) are currently in my store at darleneseitz.stampinup.net so be sure to check out these retiring items which are available until May 31st.